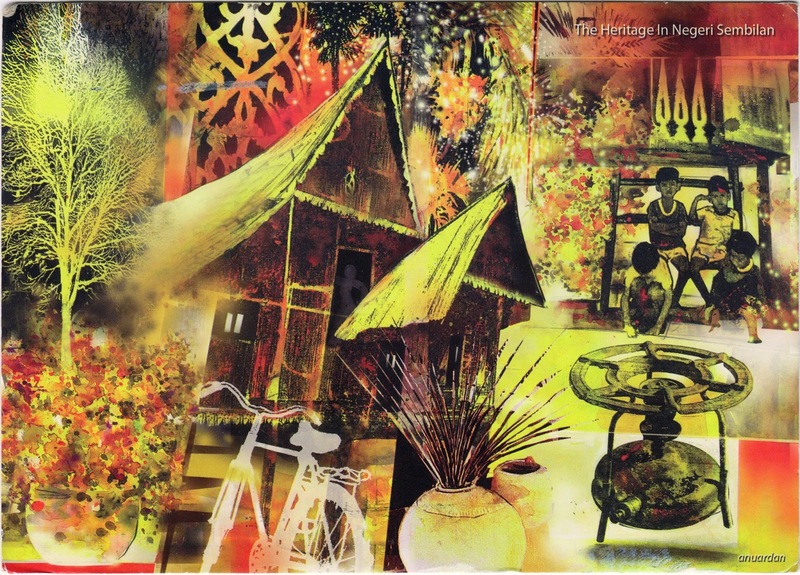 Postcard from Malaysia shows "the Heritage in Negeri Sembilan." Negeri Sembilan, one of Malaysia's thirteen states, is located on the western coast of Peninsular Malaysia just south of Kuala Lumpur. Its heritage is believed to be heavily influenced by the Minangkabau people who were originally from West Sumatra in present-day Indonesia. Minangkabau features are visible on the card in traditional architecture and local artifacts. On an unrelated note, news related to Malaysia has focused on the Malaysia Airlines flight MH370, missing since March 8, 2014. DigitalGlobe, an earth-imagery company, deployed its FirstLook service and directed two of its five satellites to obtained photos of more than 1,200 square miles of suspected crash area, and opened its crowdsourcing platform, Tomnod, to the public for help in identifying any visible evidence that could help locate the missing Boeing 777 aircraft. I was assigned this map, did you see anything? However, CNN recently reports that Malaysian plane may have flown long after last contact, which would place the plane outside the initial search area.